At the invitation of President Xi Jinping, King Harald V of the Kingdom of Norway will pay a state visit to China from October 11 to 20. At the invitation of President Teodoro Nguema Obiang Mangue of the Republic of Equatorial Guinea, Special Envoy of President Xi Jinping and Vice Chairman of the Standing Committee of the National People's Congress Zhang Chunxian will travel to Malabo, capital of Equatorial Guinea, to attend the 50th independence anniversary of Equatorial Guinea. Q: ROK President Moon Jae-in told a cabinet meeting today that Chinese President Xi Jinping is expected to visit the DPRK soon. What is China's comment? A: China and the DPRK are friendly neighbors. We have the tradition of maintaining friendly exchanges which we believe will carry on. As for President Moon Jae-in's statement, I have no information to offer at present. Q: Today marks the 15th anniversary of the establishment of China-ASEAN Strategic Partnership. How do you comment on the development of China-ASEAN relations in the past 15 years? A: You may notice that we have twenty-some guests sitting in the back. They are great young people from ASEAN countries on a tour in China. So, with your question we would like to extend our warm welcome to them. Fifteen years ago, China and ASEAN established the Strategic Partnership for Peace and Prosperity. Over the course of the past fifteen years, cooperation between China and ASEAN has been blossoming on all fronts, not only politically and economically but also socially, culturally and in people-to-people exchanges. Two-way trade in 2017 exceeded 500 billion dollars, a nearly six-fold increase compared to that of 2003 when the Strategic Partnership was just established. China has almost 100,000 students from ASEAN countries, more than an eight-fold increase compared to that fifteen years ago. These figures demonstrate that China-ASEAN cooperation has realized the remarkable transformation from quantity to quality, delivering tangible benefits to nearly 2 billion people on both sides. We are glad to see that China's reform and opening-up and ASEAN's community-building efforts have been complementing each other, creating greater cooperation opportunities and ensuring the forefront role of China-ASEAN ties in each other's external relations. As we celebrate the 15th anniversary of the establishment of China-ASEAN Strategic Partnership, China stands ready to use this opportunity to work with ASEAN to jointly chart the course for the development of bilateral relations, enhance the level of practical cooperation, build a closer China-ASEAN community with shared future, and deliver more benefits to people on both sides and in the region. Q: Do you have more details on the investigation of Meng Hongwei? Did China inform Interpol in advance? A: You may have noticed that the website of the Central Commission for Discipline Inspection and National Supervisory Commission has released relevant information. The website of the Public Security Ministry also released information on their relevant party committee meeting. Meng Hongwei is being investigated for violations of laws. It demonstrates China's resolve to pursue law-based state governance and combat corruption. Meng Hongwei took bribes and violated laws. He has tended a written resignation to Interpol. China's Ministry of Public Security has also informed Interpol's General Secretariat. Q: On October 2, the Iraqi parliament has elected a new president. What is China's comment? A: China congratulates Mr. Barham on his election. We hope that all political parties in Iraq could pool together consensus and form a new government as soon as possible so that Iraq could make new strides on political reconciliation and economic reconstruction and realize enduring stability. Q: As of October 7, the death toll from the devastating earthquake and tsunami on Indonesia's Sulawesi island has reached 1763, with another 2632 seriously injured, 265 missing. More than 70,000 people were affected by the disasters. Has China offered cash assistance to Indonesia? Will China airlift food to the affected areas? How many Chinese nationals were affected and what has China done to help them? A: China and Indonesia are friendly neighbors. We have been closely following the earthquake and tsunami disasters on Indonesia's Sulawesi island. You may have noted that President Xi Jinping sent his condolences to President Joko Widodo at the earliest time possible, expressing our sympathy towards the Indonesian people and our readiness to offer help in light of the needs of the Indonesian side. State Councilor and Foreign Minister Wang Yi also expressed his condolences to Foreign Minister Retno. My information on hand is that China Red Cross has offered emergency assistance in cash to Indonesia Red Cross. In accordance with the needs of the Indonesian side, China is organizing delivery of rescue necessities like tents, water purifiers and generators which will arrive at the affected areas tomorrow. We will continue to remain in touch with the Indonesian side and play our part in rescue and reconstruction efforts. As for Chinese people affected by the disasters, the Chinese Embassy in Indonesia activated emergency response mechanism immediately after the earthquake and tsunami happened. They have been working on various fronts to gather information on Chinese nationals affected by the disasters. So far, 37 Chinese nationals have been confirmed to be affected by the disasters. 27 of them have been evacuated to safe places with the assistance of the Chinese Embassy in Indonesia. The other 10 people decided voluntarily to stay and carry on with their work. The Chinese Embassy has warned those 10 people to heighten safety awareness and remain in contact with the Embassy. Q: US Secretary of State Mike Pompeo is now on a visit in China. We have seen a readout on State Councilor and Foreign Minister Wang Yi's meeting with him. Will President Xi meet with Secretary of State Mike Pompeo today? Will other Chinese officials meet with him? If so, who are they? When will the relevant information be released? A: Who Secretary of State Mike Pompeo will meet and talk with during his visit was arranged by our two sides in advance. The first event, which is his meeting with State Councilor and Foreign Minister Wang Yi, is still underway. You can find initial information on the Internet. China-US ties as well as our two major countries' cooperation on some major international and regional issues have been closely followed by everyone. At the very beginning of their meeting, State Councilor and Foreign Minister Wang Yi pointed out that the recent wrong words and deeds of the US side on a string of issues have directly impacted the mutual trust between our two countries. We hope that the US side can change course and come back to the track of working with China for the sustained, sound and steady development of China-US relations. Communicating with relevant parties on the Korean Peninsula issue is also on the agenda of Secretary of State Mike Pompeo's visit to East Asia. In this regard, State Councilor and Foreign Minister Wang Yi also said that the US side hopes to exchange views with the Chinese side on the Korean Peninsula issue and other hotspot regional issues. This just shows that as two major countries and two permanent members of the UN Security Council, China and the US need to and should enhance communication and cooperation. Meanwhile, such cooperation should be underpinned by a sound and steady bilateral relationship. Their meeting is still in progress. I believe more information will be released today. Please keep following that. Q: On Secretary of State Mike Pompeo's visit to China, will the tense China-US relations affect bilateral cooperation on the Korean Peninsula issue? Is it correct to assume that? A: Like I just said, China and the US, as two permanent members of the UN Security Council, need to cooperate with each other on many important international and regional issues. The two sides also need to enhance mutual trust, which will better serve bilateral cooperation. On the Korean Peninsula nuclear issue, China's position is very clear. 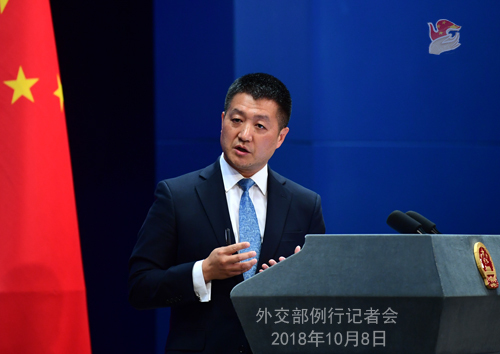 China has all along been working to advance the goal of denuclearization of the Korean Peninsula, maintain peace and stability on the Peninsula, and promote a settlement of the Peninsula nuclear issue through peaceful talks and negotiations. Regardless of what has happened in the region and on the international stage, China's position has never wavered. 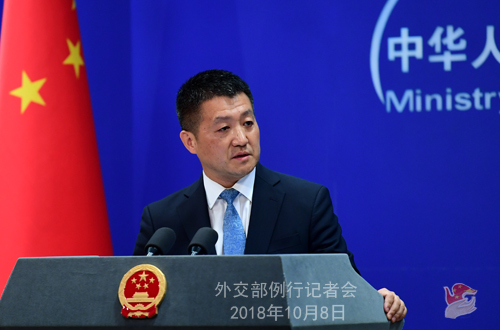 It is because of China's tireless efforts that relevant parties directly involved in the Peninsula issue have directly interacted with each other, and the processes of the Peninsula denuclearization and the political settlement of the Peninsula issue have generated some positive developments. These shall be encouraged. Q: Does China have any response to the Bloomberg Business Week report about chips placed into the products of Apple, Amazon and other US companies that would be able to access backdoor to send information to China? A: I wonder whether you have noted the denials issued by Apple, Amazon, Supermicro as well as the statement by the US Department of Homeland Security. Given all these, do you still see any need for China to make a response? If you are really interested, you may ask the Bloomberg Business Week how they would like to respond to these denials and statements? Q: Could you tell us whether the decision not to renew the work visa for the Financial Times correspondent Victor Mallet was that of the Hong Kong SAR government or the Chinese central government? How do you respond to criticism that this undermines Hong Kong's reputation as a place that protects freedom of speech and assembly? A: The Hong Kong government is a government of China's Special Administrative Region (SAR). The Hong Kong SAR government exercises administration over the entry, stay and exit of people from different countries and regions in accordance with the Basic Law of the Hong Kong Special Administration Region, and it has the right to decide whether a Hong Kong work visa should be renewed or not. Since Hong Kong's return, under the guidance of the "one country, two systems" policy, remarkable socio-economic progress has been made in Hong Kong. The Hong Kong SAR government is exercising its legitimate right in accordance with Chinese laws, be it China's fundamental law or the Basic Law of the Hong Kong Special Administration Region, which is beyond reproach. Q: Reports from Pakistan say that Saudi Arabia is also joining as an investor in the CPEC, and later it has been clarified that Saudi Arabia will be investing separately in Pakistan. How does China respond to this particular new development? A: The China-Pakistan Economic Corridor (CPEC) is an important project under the Belt and Road. Since the Belt and Road Initiative was put forward five years ago, the Chinese side has been following the principle of wide consultation, joint contribution and shared benefits, which also applies to the CPEC. Such cooperation for development has always been an open, transparent and aboveboard process. On the basis of wide consultation, if any other party can contribute to better interconnectivity, development and prosperity of this region, this surely makes a positive factor. Q: I would like to get a general sense of how the Foreign Ministry sees this case of Meng Hongwei? What conclusions do you believe the international community should be drawing? A: Like I just said, the case of Meng Hongwei is still under investigation. 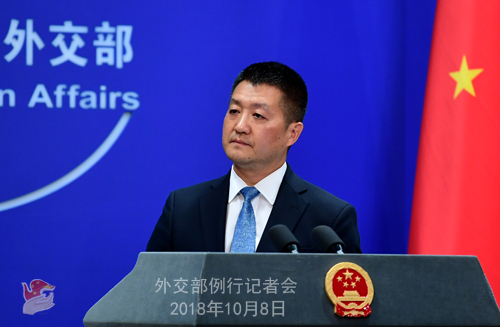 As for the handling of this case and your question about what conclusions the international community can draw from it, like I just clarified, this fully demonstrates that the Chinese government's determination to combat corruption and criminal activities is unwavering. 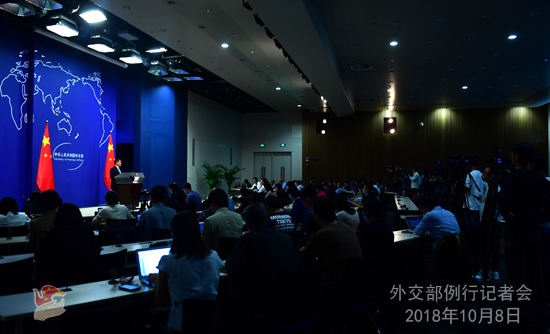 The press release about the Party Committee meeting of the Ministry of Public Security issued by the Ministry's website has made it very clear that this case fully testifies to the clear attitude and firm determination of the Party Central Committee with Comrade Xi Jinping at the core to strengthen Party discipline and see the anti-corruption campaign through. It also specifically mentioned that there is no privilege or exception before the law. Anyone who violates the law will be held accountable and severely punished. I believe that the overwhelming majority of members of the international community will have correct views and conclusions about this.